What is the first thing that comes to your mind when you think about American football? I bet it’s not women. Today women play American football in 15 countries around the world, and six of these countries have now come together to compete in the sports second Women’s World Championships. Laura Jaakola, 30, is one of the women to play for team Finland. It’s going to be her first Championship tournament and she is happy the sport has gone forward so much that it’s possible to organize such events. - I would have never believed to playing for team Finland. I’m really happy and proud of myself for what I have accomplished. For couple of weeks, it’s nice to be able to feel what it would be like to be a professional football player. From preparatory camp to the end of the tournament, I’m only going to be living for the sport. 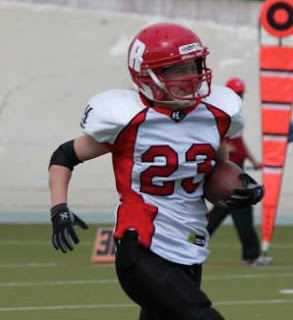 Laura had a break from American football but came back to it this year for the chance to compete in the Finnish national team. 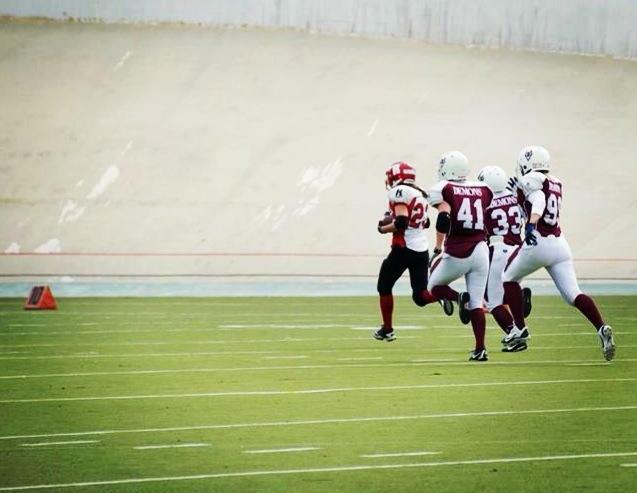 - American football is not just a hobby to me, it’s a lifestyle. My philosophy is if I can’t give it a 100% I won’t do it all. This is a team sport and if I can’t give 100% it’s always away from the team. - I came back because I missed the unity of a team and the feeling to be fighting toward common goals. Of course I have to say that the World Championships played a part in my return to the sport and the fact the games are held in Finland. In the opening game Finland is facing team Spain. Spain is a first timer in the Championship circle and Laura says it’s going to be very interesting to play against them. - We have no experience of them as a team, so we can expect anything. I’m counting down the days for the first game. Some days it feels like there is too much time before we are on the turf playing and hopefully winning against Spain and Canada. But Spain and Canada are not the teams causing all the buzz amongst the Finnish team she says. - When we talk about the past or the upcoming championship tournament in the team, it’s always about team USA. It’s the one team everyone wants to play against. USA is the reigning title holder, but Laura believes Finland has a very good chance at being in the medal games. She says team Finland is steady team, where there is no emphasis on individual performances. - We are a team and we play as a team. Everyone gives all they have in every practice and every drill. We are going to put ourselves on the line to the fullest and do our best. It should be enough. - The dream is to get a medal. For someone who has been involved with variety of sports, Laura says it only needed one practice to get hooked on American football. Back 2004 her friend lured her to try the sport, being semi contact game at the time, while she was studying in Jyväskylä. - I liked how strategic and fast the game was, playing in the moment. Laura will be playing in the moment with rest of team Finland, starting on the 30th of June 2013 at ISS Stadium, Vantaa. - My goal was to come back and be part of team Finland, which I have accomplished. On 30th of June, I’ll be proud to wear my Finnish national team jersey and represent my country and fight for the medals.